Part one: Worf and Garak head to the Gamma Quadrant in a runabout after receiving a message from our old bud Enabaran Tain (Paul Dooley), assumed killed by the Dominion back in “The Die is Cast”. They stumble upon a huge fleet of Jem’Hadar ships and manage to get a message to DS9 before they’re captured. As Sisko starts readying the station for a Dominion attack — and loops in Gul Dukat, still apparently engaging in a private war with the Klingons — Worf and Garak are taken to a prison camp where Tain is being held, along with General Martok (J.G. Hertzler), who apparently had been replaced by a Changeling before we first met him in “The Way of the Warrior”. Even more surprising, Bashir is being held there(!) meaning he’s been replaced by a Changeling back on the station. Sisko decides to close the entrance to the wormhole — Starfleet’s not in a good position to fight a war — but the efforts are sabotaged (almost certainly by the Bashir Changeling) and as the credits roll … the Dominion fleet enters the Alpha Quadrant. Part two: The Dominion fleet, takes a hard look at the station and then heads directly to Cardassia. Dukat follows them in his ship and tells a horrified Kira on the viewscreen that he has been in negotiations with the Dominion for months and Cardassia has … joined the Dominion. Shortly thereafter, Dukat announces that he intends to take back all of his people’s property — including DS9. A Klingon fleet limping back from Cardassia after getting beaten up by the Jem’Hadar stops at DS9 for assistance and Sisko gets Gowron (Robert O’Reilly) to agree to reinstate the alliance with the Federation and make a stand against the Dominion. Meanwhile in the prison camp, Worf is being repeatedly challenged by Jem’Hadar and Garak must overcome his claustrophobia to adjust the transmitter Tain used to send the message — Tain has died — to signal the runabout. He’s successful, and the prisoners escape, allowing Bashir to send a message to the station, allowing Sisko to figure out that the Bashir on the station is a Changeling. By this point, the Federation and Klingon fleets have been joined by a bunch of Romulan vessels, awaiting the Dominion attackers — and the Bashir Changeling has stolen a runabout with the idea of causing Bajor’s sun to explode, destroying the station and the fleet. Kira, on board the Defiant, is able to stop the Changeling, and the escapees from the prison camp make it home. As the episode ends, Dukat contacts Sisko, setting up the inevitable showdown between the two of them, and between the Federation and the Dominion. The Dominion enters the Alpha Quadrant. Only took 2 1/2 years. Well, I’m not sure I even need to explain, given the summary. But the events of these two episodes set up the final 2 1/2 seasons of DS9. Much of the rest of the fifth season is about the lead up to what feels like an inevitable war and the final two seasons are about the war. The sides of the conflict are drawn with the Cardassians and Dominion on one end and the Federation, Klingons and (later) the Romulans on the other. Remember that before this episode, the Federation was really tighter with the Cardassians than the Klingons, as the Federation was providing assistance to beleaguered Cardassia in the fourth and fifth seasons . This episode sets all of that on its head in a (mostly) satisfactory and compelling way. It also sets up the Sisko/Dukat rivalry that is a major thread throughout the rest of DS9. Since the second season, Dukat had been a sort of strange bedfellow of the DS9 crew, even helping Sisko and Co. infiltrate Klingon space in “Apocalypse Rising”. Here, he becomes the series’ main villain. It was a bold choice that paints Dukat as the ultimate pragmatist and opportunist. Although I’m not a huge fan of where they take the character later, Dukat selling out to the Dominion to gain power is totally believable. 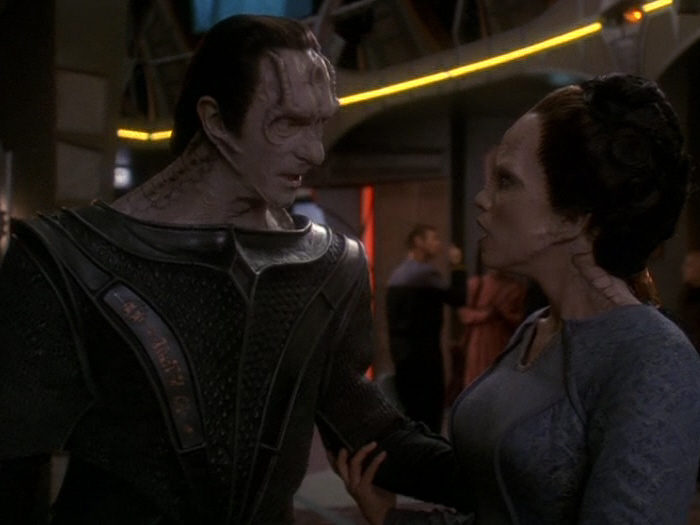 I didn’t get into it in the recap, which was long enough, but there’s also the evolving relationship between Garak and Ziyal (Melanie Smith, the third and final actor to play the character), which was a subplot back in “For the Cause” but really takes off here. Ziyal’s love for Garak (a sworn enemy of Dukat) is a big part of what happens over the course of the next season. Buckle up. This is gonna be a long one. But let’s talk about what I would consider DS9’s biggest continuity error, and possibly the biggest continuity error in all of Trek. When we meet Bashir in the prison camp, he’s wearing the DS9 uniform we saw in the first four seasons and into the fifth. Essentially, it’s a mostly black jumpsuit with the Starfleet color differentiators (red for command, blue for medical, etc.) across the shoulders. Beginning in “Rapture”, the DS9 characters started wearing the updated versions (first seen in “Star Trek: First Contact”) which have grey across the shoulders and the color differentiators in the turtleneck undershirts. I know this isn’t the most exciting thing to discuss, but stay with me. That real Bashir is wearing the older uniform means we can fairly easily determine when Changeling Bashir first appeared on DS9 — before “Rapture”. And, people, boy does that cause some issues. — “Rapture”: Sisko starts having visions and needs Bashir’s help to save his life. So, the Changeling infiltrator would need extensive knowledge of human brains and medical abilities to fool everybody. Right. — “The Darkness and the Light”: The only episode in which Changeling Bashir appears that isn’t eye-rolling in retrospect — assuming you buy the overall conceit that Changelings can act like anyone at anytime without raising suspicions. Really, the creators just blew it here. They used the uniform thing as a way to help the audience distinguish between the two Bashirs. But that could have been done with Bashir wearing off-duty clothes in the prison camp, if it needed to be done at all. Big picture, the Changelings’ seemingly magic abilities to mimic anyone and anything were always a stretch, but the creators stretched them beyond belief here. One other thing. Sisko mentions the recent “Borg attack” in this episode, an apparent allusion to “Star Trek: First Contact”. The stardate in that movie puts it much later in the season (small thing, I know) and we never hear anything about how Worf took the Defiant to Earth and helped, you know, save Earth. There’s also the bit about the Defiant being heavily damaged in that movie. We never hear about it needing repairs or how it returns to the station. Part two is where things go even further off the rails because of problems within the episode as opposed to continuity with other episodes/movies. First, let’s talk about the renewal of the Federation/Klingon alliance. Sisko, apparently, without any higher authority, just renews the treaty with Gowron. 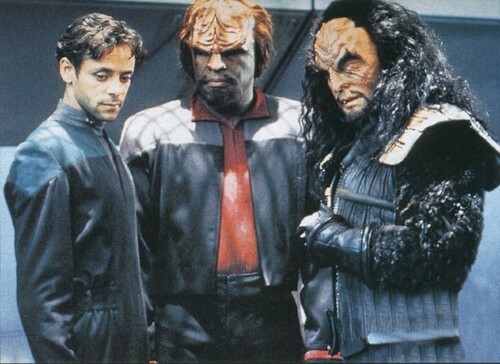 Now, Gowron is the leader of the Klingon Empire, but Sisko’s just a (relatively important) Starfleet captain. Could he really do what he did here? Beyond that, the renewal is (apparently?) part of the Dominion’s larger plan. The Bashir Changeling stands by and lets it happen, perhaps with the idea that it would bring the Federation and Klingon fleets to DS9 to be destroyed. But it’s clear that only parts of both fleets show up. So, sure, the supernova would have wiped out a lot of ships (and the station) but it also would have renewed a power alliance that opposed the Dominion. There’s also the bit about Changeling Bashir modifying a runabout to carry out his plan. I’m sorry, but if security was that lax — the runabout’s shields were upgraded and a protomatter device was installed! — then the Dominion could have defeated the Federation in about 20 minutes. Then, there’s the prison camp stuff. Let’s assume that Garak (and Tain, before him) really could use the old life support system near our heroes’ cell to send out a signal that the Dominion (apparently?) couldn’t detect. Why, in the HELL, did the Dominion LEAVE THE RUNABOUT PARKED NEAR THE CAMP? Lastly, we have Sisko’s amazing powers of deduction at the end of the episode. Consider that he’s standing in ops waiting for a major attack. There are Starfleet, Klingon and Romulan ships ready to fight and sensors are detecting enemy vessels. Then, a non-visual transmission from the Gamma Quadrant comes from Bashir (in part one, Sisko was skeptical that a similar transmission from Tain was genuine). Sisko, correctly, figures out that the Bashir on the station is a Changeling. But, but, but … how did he do that? 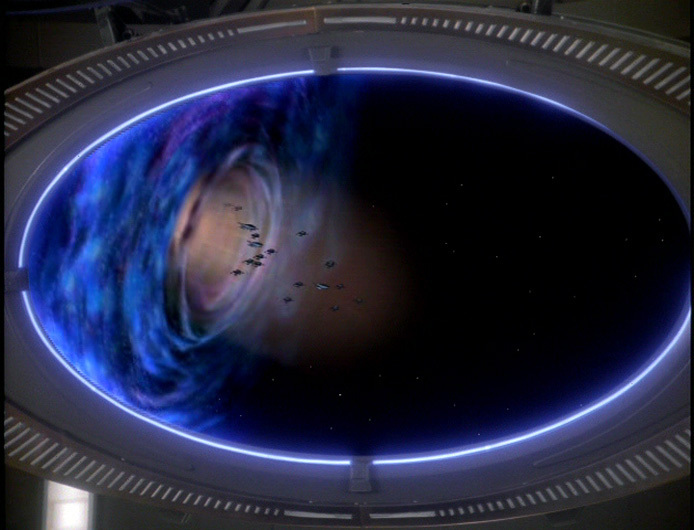 Wasn’t it just as possible that the message from the Gamma Quadrant was a fake? I suppose Sisko figured it out because the computer told him Bashir had last been at a runabout pad, and Sisko could have figured that the real Bashir wouldn’t have ever been there at that point in time. But Sisko’s next actions are odd. He tells Kira (on the Defiant) to destroy the runabout, not to just stop or capture it. In other words, there’s no doubt in his mind that the Bashir on the station has been a Changeling. Finally — and props to you, if you’ve made it this far — where in the hell is Odo in these episodes? He shows up at the very beginning of part one and then is only mentioned in dialog. In all other episodes involving Changeling infiltrators, Odo is a huge part, and the return of his shapeshifting abilities could have made for some interesting scenes here. Not seeing him much in this two-parter isn’t necessarily an error, but it’s odd. So, I realize I just tore this two-parter to shreds. Funny thing is, I also really enjoy watching it. I actually think it’s incredibly representative of DS9. That is, the two-parter was incredibly ambitious — frankly, to a fault. It stacked the deck so high that the only way for our heroes to win was with some really ridiculous plotting, i.e. the Dominion parking the runabout near the prison camp and Sisko’s amazing deductive powers. Now, I’ll take “ambitious to a fault” over “boring and episodic” any day — wait until we get to Voyager, people — but I need to point out faults when I see them. And there are just a TON in this two-parter. It’s too bad the creators didn’t avoid the uniform nonsense, had found a more plausible way for the prison camp gang to escape (a stolen shuttle?) and for Sisko to have more obvious clues. None of that would have been that difficult, but the creators just got sloppy. Shame. A much shorter review, we promise. Eddington’s back!